Preliminary U.S. intelligence estimates have concluded that North Korea’s fourth underground nuclear test on Tuesday involved a small explosion that could be a component of a larger-scale thermonuclear device. U.S. officials familiar with intelligence reports of the underground test estimated the low yield of the detected blast to be between 5 kilotons to 7 kilotons—far less than would be detected in a two-stage thermonuclear blast, or hydrogen bomb. The Pyongyang government announced that the test that took place Wednesday morning local time at a nuclear testing site in northeast North Korea and that it was a successful "first H-bomb test." The test was announced in two official statements broadcast on state-run radio and television. Unlike the past three nuclear tests, the regime conducted the test with no advance notice. Past tests were preceded by stern public warnings in state-run media. Also in a break with practice, the two official North Korean statements asserted the test was directly ordered by North Korean leader Kim Jong Un. 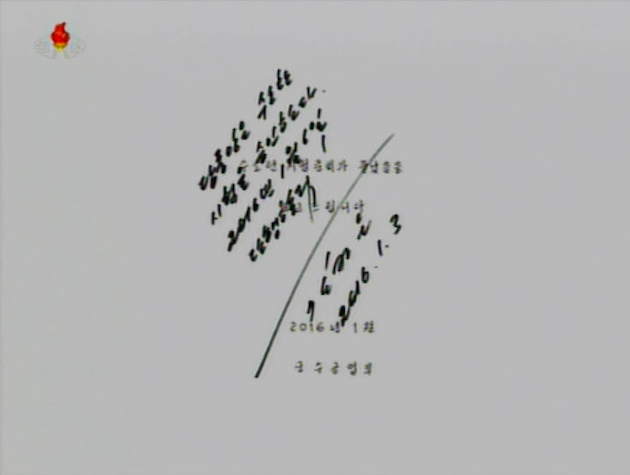 A copy of Kim’s written order was shown on North Korean television, and he was shown signing the order. Another unusual feature in the handling of the nuclear test were statements indicating the blast was carried out "safely and flawlessly" without harming the environment. The statements noted that North Korea is a responsible nuclear power and would not be the first to use nuclear arms in a conflict and would not transfer nuclear technology unless "hostile forces infringe upon its sovereignty." Initial U.S. intelligence analysis of the official statements indicates the test had two goals. One key objective for the underground blast was to bolster statements last month by North Korean leader Kim Jong Un that the North has developed a hydrogen bomb. By conducting the test, Kim is seeking to cement his position within the regime. The supreme leader turns 33 on Friday and is widely viewed by intelligence analysts as inexperienced, compared to his father and grandfather, Kim Jong Il and Kim Il Sung. A second objective of the test was to persuade China, North Korea’s main patron, to back off pressuring the regime to abandon its nuclear program. The harsh language used in the official statement—including a threat to adopt a more hostile posture in the coming months—were interpreted as a sign that the current tense relations with China over its opposition to the nuclear program was a main driver behind the surprise nuclear test. "Initial reports indicate the North Koreans may be bragging a little bit too much," said one official of the claims of a hydrogen bomb test. The test was widely reported on social media shortly after it took place based on detection of a 5.1 magnitude seismic event Tuesday evening near a nuclear test site called Punggye-ri, in Kilju, North Hamgyong Province. The test prompted international condemnation but a limited reaction from the Obama administration, which sought to play down the latest nuclear provocation. In New York, the United Nations held an emergency meeting during which additional sanctions on North Korea were discussed. Sanctions were imposed after earlier nuclear tests in 2006, 2009, and 2013. At the Pentagon, Defense Secretary Ash Carter, who was briefed on the test by Gen. Curtis Scaparrotti, commander of U.S. Forces in Korea, spoke by telephone to South Korean Defense Minister Han Min Koo. Both officials agreed the test was an "unacceptable and irresponsible provocation" as well as a "flagrant violation of international law and a threat to the peace and stability of the Korean Peninsula and the entire Asia-Pacific region," according to a statement. Carter stressed in the call the United States was committed to maintaining U.S. extended nuclear deterrence protection for South Korea. The White House said the United States and regional allies would take up the test at the United Nations, which sanctioned North Korea for past nuclear and missile tests. "What is true is that North Korea continues to be one of the most isolated nations in the world and their isolation has only deepened as they have sought to engage in increasingly provocative acts," spokesman Josh Earnest said. On Capitol Hill, senior Republican leaders criticized the Obama administration for weak policies toward the rogue state. House Speak Paul Ryan said the increasing nuclear threat posed by North Korea grew out of the failed nuclear agreement with North Korea reached by the Bill Clinton administration. "This is exactly what happens when we appease and embolden rogue regimes," Ryan said, noting the test had not been confirmed. "President Obama has been guilty of this on more than one occasion," he added, noting failed policies in Syria and Iran. "The world is a safer place when we stand up to brutal regimes like those in Tehran, Damascus, and Pyongyang—and that’s not happening under our current president," Ryan said. House Armed Services Committee Chairman Mac Thornberry said the test shows "the world is rapidly growing more dangerous, and the United States cannot afford to focus only on ISIS or Iran or Russia." "We must be prepared to protect our national security against many threats," Thornberry said. "Unfortunately, the view around the world is that U.S. leadership is in decline while the administration's inaction only fuels those concerns." Thornberry called for deployment of the Terminal High-Altitude Area Defense anti-missile system in South Korea and for strengthening the U.S. nuclear deterrent. Rep. Mike Rogers, chairman of the Armed Services subcommittee on strategic forces, criticized the president’s policies. "While the president has wasted his two terms in office, North Korea has continued to develop its ballistic missile and nuclear weapons capabilities," Rogers added. Former Pentagon nuclear forces official Mark Schneider said the reported low yield of the test indicates the blast was not a thermonuclear device. "It could be a fission trigger or primary for a thermonuclear weapon," he said. Schneider said nuclear specialists at Los Alamos National Laboratory are betting at estimating nuclear yields than U.S. intelligence agencies, which during the Cold War consistently underestimated Soviet thermonuclear tests. "If the yield is significantly higher than the 6-kt estimated in [news reports], it could be more than a primary test," Schneider added. North Korea is estimated to have a stockpile of between one and several dozen missile-deliverable warheads. Rep. Mike Pompeo, a member of the House Permanent Select Committee on Intelligence, said the North Korean nuclear threat is "a frightening vision of a future with President Obama’s nuclear agreement with Iran." "We cannot continue President Obama’s policy of turning a blind eye to North Korea and Iran." A Chinese government spokesman said Beijing opposed the test but warned Japan not to take provocative counter actions in response. China has sought to rein in North Korea military provocations, including nuclear and long-range missile tests. "We strongly urge [North Korea] to remain committed to its denuclearization commitment, and stop taking any actions that would make the situation worse," Foreign Ministry spokeswoman Hua Chunying said. The European Union, in a statement, said that if the test blast is confirmed as nuclear it would be "a grave violation" of North Korea’s international obligations under U.N. resolutions not to produce or test nuclear weapons. A nuclear test would be "a threat to the peace and security of the entire North East Asia region," the EU said. NATO Secretary General Jens Stoltenberg criticized the announced nuclear test. "I condemn the continued development by North Korea of nuclear weapons and ballistic missile programs and its inflammatory and threatening rhetoric," he said. The latest nuclear test was not a surprise and followed a recent boast from Kim, the North Korean leader, that his state had developed a thermonuclear bomb. South Korea’s Chemical, Biological, and Radiological Defense Command, a Defense Ministry group, stated in a report made public Sunday that a nuclear test was expected but that it likely would not be a large-scale thermonuclear blast. "We can’t discount the possibility that the North’s excavation of a new tunnel at its Punggye-ri test site could be designed for thermonuclear weapons tests," command said. "Considering its research of nuclear technology, its history of underground and projectile tests, and elapsed time since its nuclear development, North Korea has the foundation for thermonuclear weapons, the report added according to the semi-official Yonhap news agency. Thermonuclear bombs are advanced weapons that employ a nuclear blast to create a larger hydrogen blast. Former Defense Intelligence Agency official Bruce Bechtol said if the test was a hydrogen bomb "this means the North Koreans are advancing their nuclear weaponization program at a faster and more efficient—and deadly—pace than most analysts have predicted in the past." "Yes it changes things," he added. "It increases the possibilities regarding the threat that North Korea can pose to South Korea, the region, and the USA." 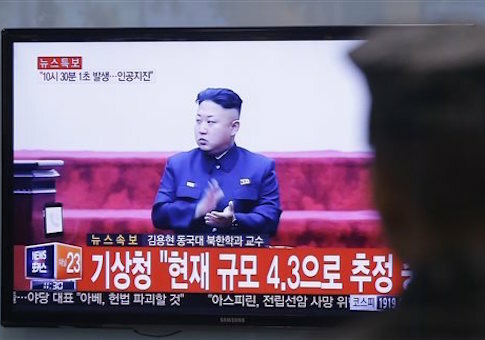 The nuclear test follows North Korea’s successful submarine missile ejection test Dec. 21 from a submerged submarine. The test was regarded by U.S. intelligence agencies as a significant advance in Pyongyang’s bid to develop nuclear-armed submarine-launched missiles. The submarine used in the test, known as the Gorae, or Whale, suffered a serious malfunction in attempting an ejection test Nov. 28. That test nearly sank the submarine, which returned to port listing at a 45-degree angle, according to U.S. officials.